Nakajima, Miyaoka, Doi and Tsurushima continued to prepare for the product launch in October 1982. At the same time, Ohga, Michael P. Schulhof of Sony Corporation of America, Akira Suzuki head of Sony's DAD Promotion Department, and representatives of Philips gave numerous presentations to record companies and musical groups around the world in order to make the CD an internationally accepted standard. However, while visually attractive, the small, sparkling silver CD that was to replace the black vinyl record was viewed as a threat. The reaction of the record industry was strong, and opinion wavered between support and condemnation. For Ohga, it was as if he was being treated as an enemy of the record industry. When he and others spoke in favor of the CD saying, "The CD will become the next generation medium in the audio industry. Let's go with it," those who opposed it responded, "We've taken so much trouble to develop standards for the LP, we're satisfied with it. Don't make us spend money on this new medium. Don't give us what we don't need." Demonstrations of the CD were made worldwide using the not-yet perfected prototype. In New York, at a joint press demonstration with Philips, one of the engineers out of view from the journalists, was busy doing his utmost to prevent the system from overheating by cooling it with a Japanese paper fan. In order to make the CD system an international standard, Ohga continued to promote it around the world, while preparing for the mass production of CD software. As Ohga said, "Even if we have the hardware, it's useless without the software." CBS/Sony Records, which was formed through a joint venture with CBS Inc. in the U.S., had established a plant to mass-produce 30 cm LP records. Ohga was determined to develop the digital audio disc together with Philips because the existence of CBS/Sony Records depended on it. As CBS/Sony had a large share of the record market, Ohga planned to make use of its software production know-how and sales network. However, precisely because of the company's extremely solid sales performance, CBS executives in the U.S. were against the development of a new digital audio disc. Moreover, considerable investment would be needed to set up a full-scale CD manufacturing plant. The pressing process used to make vinyl LPs was vastly different to the technique used to produce CDs, which needed state-of-the-art IC equipment. It would thus be necessary to replace a considerable part of the equipment in the LP plant. As this was a joint venture agreement, it was necessary for Sony to obtain consent from CBS if CBS/Sony was going to invest the necessary funds for a new plant and equipment. CBS/Sony at the time boasted profit ratios significantly higher than other companies in the Japanese record industry and did have sufficient funds to invest. Ohga persuaded the CBS executives by saying, "Every year CBS/Sony declares a dividend that is equal to 100% of its capital. With just a portion of the profits generated by CBS/Sony, we can build a CD manufacturing plant." Ohga's argument convinced the CBS executives. Using its own funds, CBS/Sony built a full-scale CD software production plant in Shizuoka prefecture. The company did this without any financial assistance from either Sony or CBS. The world's first CD software production line commenced operation in April 1982. The months leading up to the scheduled October product launch were difficult for all concerned. The problem with discs warping remained until the very last minute. After successively testing various materials, a new material called polycarbonate, used for making automobile bumpers, was found. Production of discs got under way in mid-September, about two weeks before the launch. On August 31, 1982, an announcement was made in Tokyo that four companies, Sony, CBS/Sony, Philips, and Polygram had jointly developed the world's first CD system. These companies announced that they would commence domestic sales in the autumn. From the evening of August 31 to the next morning, there were many news reports about the CD system, touting it as "the development of the amazing digital CD player" and "the arrival of the digital age." The 12 cm CD player was light and compact, offering a one-touch selection function, was compact, lightweight and utilized a medium that was almost permanently durable. It was a dream come true for many audio fans. The CD system represented a fresh wind of change for the recession-ridden audio equipment industry. On October 1, 1982, Sony launched the CDP-101. Ohga said, "In demonstrations, Sony had positioned the disc vertically in the player, but it was actually easier to insert the disc horizontally." As a result, the CDP-101 was manufactured so that the disc spun on a horizontal plane. Other companies designed systems in which the disc was inserted vertically, in the same way as Sony's test model, the "Goronta." It had been approximately 100 years since Edison invented the phonograph, and record technology had been revolutionized about every 25 years since. First, the cylinder system was changed to the disc system. Then the electric record system and the LP record were invented. Soon after, monophonic sound was superseded by stereophonic sound. Finally in 1982, 100 years after the Edison phonograph, digital audio technology was born. Idei named the first Sony system the CDP-101. He worked relentlessly to launch the system and had based the model name on the numerals 0101 as a reference to the digital medium. In the binary language, 0101 represents the number five. Idei chose the number five to indicate that the product was of a medium class. The product launch actually took place without Idei, who was lying on a hospital bed suffering from a bout of pneumonia he had caught during the frenzy to commercialize the system. When Idei saw the CDP-101 advertisements in newspapers in the hospital, he said to himself, "Ah, it has finally been launched." The CDP-101 retailed at 168,000 yen, a steep price for the average consumer. However, compared with other systems, Sony's was actually inexpensive. There was talk of developing a less costly and more compact model. Given the short development period, it was a miracle that they had managed to commercialize the system at all. Some time later, the sample discs that had been used all over the world for demonstrations found their way back to the engineers. Although the surfaces were covered with scratches, when the discs were put in the player, the sound quality was as if new. In addition, while Sony was launching the CDP-101, CBS/Sony launched the world's first fifty CD titles, the very first one being "52nd Street" by Billy Joel. The first fifty titles included classical, popular and rock releases. CBS/Sony took the opportunity to sell not only to audio fans but also to a wide range of people. Until then, electronics companies had only targeted such high-end audio products like the component stereo system representing 5% of audio fans. After the second and third set of CD titles were released, the total number of titles at the end of the year reached approximately one hundred. When the three different digital audio disc systems were appraised at the DAD Conference two years earlier, the Sony and JVC systems were accepted. However, with Sony's launch of the CD system, almost all other hardware companies announced that they would market products based on the Sony and Philips standard. In this way, the CD became accepted as the defacto industry standard, the result of an active worldwide promotion of the standard for a period of two years before product launch. Thus, the CD system was introduced worldwide. All divisions at Sony cooperated to commercialize CD hardware. Moreover, both Sony and CBS/Sony jointly developed hardware and software, doing everything possible to make the CD a product of the future. Ohga later said, "There has never been an example as strong as the CD of how effectively the combined power of the Sony Group can be." aim for with the D-50. 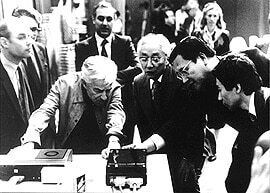 After the launch of the first CD player, Tsurushima and his colleagues at the Engineering Development Department of the Audio Business Group decided to develop a more compact CD player that required fewer parts and less power. They worked vigorously to improve the CDP-101, enlisting the help of other divisions, while striving to develop a one-chip LSI circuit and reduce the size and thickness of the optical pickup device. The Audio Division, under the leadership of Idei, was pushing ahead with a project to reduce the cost of the CD player. They called this project the "CD CD Project," or the "Compact Disc Cost Down Project." To meet a price target ranging between 50,000-60,000 yen, it was necessary to significantly reduce the costs of the optical pickup device and semiconductors used. Idei and his team approached the relevant people with requests to build these parts at a specific reduced price. At first, they were told it was impossible. However, members of the division overseeing the development of these components did everything they could and eventually found a way to manufacture cheaper and more compact parts. In autumn 1983, Sony had the technology to build a CD player deck that was one-tenth the size of its first player. 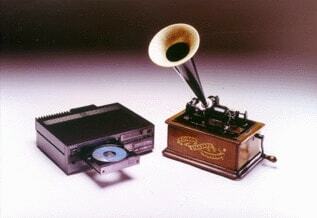 The tremendous effort that went into the development of these key devices yielded a greatly enhanced CD system. By the beginning of 1983, several other companies began selling CD players. Roughly one thousand CD titles were available, and the CDP-101 was selling well by year's end. This initial frenzy gradually subsided, however, and the CD market was lackluster for nearly a year. Customers who had purchased the original CD systems were mainly audio enthusiasts, such as lovers of classical and jazz music. At the time, many people were still satisfied with LP records. The market appeared saturated, and the poor state of the audio equipment industry seemed unlikely to improve. Executives at Sony realized that something had to be done to revive the market. A product that would popularize the CD needed to be launched quickly. Amidst this, Sony introduced a revolutionary CD player, the D-50. This was the first portable CD player from Sony, and it was the size of a CD case. The General Audio Division, which handled portable tape recorders and radios, was responsible for commercializing the D-50. "We're going to commercialize a CD player of this size," said Ohsone, head of the General Audio Division while showing his staff a piece of wood which was 13.4 cm across and about 4 cm thick. This was about the same size as four CD cases stacked one on top of another. He added, "I don't care how you do it, or whether you decide to put cicadas or grasshoppers in it, but just make this produce sound." Everyone laughed. Although Ohsone was always humorous and optimistic like this, meeting his targets always seemed difficult. His staff was in disbelief. Ohsone had the custom of using wooden models to illustrate the target sizes of future products. "Like this," he would say pointing to the wood, "don't focus on the difficulty of making the technology even smaller. Just make it a size that pleases users." Under Ohsone's direction, members of the General Audio Division toiled to create a smaller and thinner CD player. Morita, who was chairman at the time, wanted to see the CD gain widespread consumer acceptance. Regarding the target price, he said, "Let's offer it for less than 50,000 yen. We might go into the red at first, but later we'll turn a profit." The price of the new product was set at 50,000 yen (about one-third the 168,000 yen price of the CDP-101). The 50,000 yen target price was actually half the cost price of the new unit. In November 1984, the second anniversary of the CD, the D-50 was launched and it caused a great sensation in the audio world. Retailing at only 49,800 yen, the D-50 was the size of a CD case and it offered similar functions to the CDP-101, but came without a remote control and repeat functions. 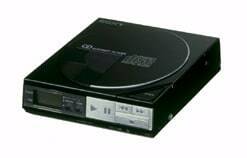 Even those within Sony could not believe that Sony had launched an advanced CD player that sold for less than 50,000 yen. The D-50 acted as a catalyst, turning around the sluggish audio industry from the first day of its launch. One member of the development team who was unable to contain his surprise, remarked, "We never imagined that the D-50 would sell this well." After a year and a half on the market, the D-50 became profitable. As the product gained popularity, Sony began to create a portable CD market. The result was that all other audio equipment manufacturers slashed the price of their CD players. The number of CD titles suddenly grew, and the CD industry as a whole saw a full-scale recovery. Sony's line of portable CD players, which enjoyed widespread popularity following the success of the D-50, was nicknamed "Discman" since these portable players allowed the user to enjoy music while on the move similar to the Walkman. The gains in Sony's audio business were also partly due to the leadership of Nobuo Kanoi, who had become head of the Audio Business Group. Kanoi's production and sales policy was to develop products that instantly attracted customers due to brand recognition. He repeatedly told his staff, "Go visit electronics shops and see what customers are buying." He encouraged the development of high quality products at affordable prices through efficiency in design and production. Kanoi worked actively to improve the international culture of the Audio Business Group and often held seminars that ran late into the night. His beliefs, referred to as the "Kanoi Theory," were widely adopted by Sony employees.